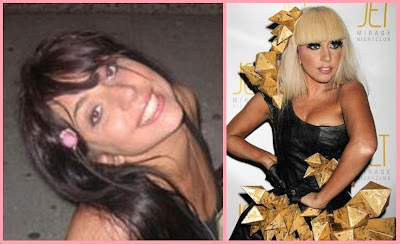 The photo on the left shows performer, Lady GaGa, before she was famous. The photo on the right shows her now! Huge change! Her style is... crazy! hahaha. She is fun, new, and crazy. I love her style and think she should stay with it. look at her real pics at "lady gaga before"
if youre so stupid that you cant tell that its obviously lady gaga, youre just plain stupid...its totally her, no doubt about that. she MIGHT have gotten a nose job or it could just be the angle and lighting. i love lady gaga now but she was just as pretty before! She's a tramp in both. But she does looks better in the before photo. for me this just shows how fake she is. I think that she looks more beautiful naturally. I love her music nd I love her as an artist, but I think that she can just tone don the stripper act a bit. I ABSOLUTELY LOVE HER AS A ARTIST & YES HER STYLE IN INSANE.. I UNDERSTAND WHY HER STYLE IS SO DIFFERENT BUT COME-ON THE TRUE BEAUTY IS THE BEFORE PICTURE!! ((just a question)) why would anyone want to look anything but the best of their beauty? ?